If you are thinking about becoming a serious volleyball player then you need to be looking for the best volleyball shoes. We want to help you find the shoes that are right for you on every level and so we have put together a list of top-notch shoes from both men’s and women’s categories. and a shoe that is flexible so it will move with you on the court. All these features are designed to help improve your performance when on the court. When you choose the best, you will have a shoe that is not only good for volleyball but that will be good for other sporting or athletic activities as well. There are many models on the market and many models of crossover shoes that are suitable for multiple sports. We have brought you the top ten shoes (five in each category – men’s & women’s) to help you narrow down the options and get the best value for your money while having the shoe that will improve your performance on the court. The ASICS Gel Rocket 7 is made with a textile upper and a rubber sole. It features the Trusstic system which allows for the soles lightweight advantages. This system not only reduces the weight of the shoe but also provides the support to maintain the structure of the shoe and also gives it the quality of durability. The outsole is made from NC rubber and with this natural rubber the shoe provides more traction. The gel cushioning system helps to absorb shock, so your feet are protected from impact. You will love this shoe if you need enhanced shock absorption and comfort. You will love the fact that having more natural rubber allows the rubber sole to provide you with better traction. Available in 10 different styles the fashion forward woman will love the amount of variety there to choose from. Verdict: This is great if you are a part of a professional team, you can definitely find something that will match your team’s colors. You will also love the way the lightweight design helps you to be better at your game. The Mizuno women’s Z WOMS BK-SL is made with a synthetic upper and rubber sole. It is made in a low top design with color pop logo accents and waxed overlays. It is lightweight, provides stability, cushioning and even shock distribution thanks to the parallel Mizuno Wave construction. It features Dynamation which helps the shoe to provide you with stability and agility to bring forward your “A” game. The outsole is made from non-marking XG rubber which provides you with a high-traction grip. You will love the color pop accents if you want shoes that are effervescent as you are. This shoe remains fashionable, lightweight and girly while providing you with the massive traction, shock absorption; stability, agility, speed and cushioning you need to succeed at your game. Verdict: If you are an elite athlete, you should look the part and this Mizuno provides the avenue for that. The ASICS Gel-Flashpoint 2 is synthetic with a rubber sole. 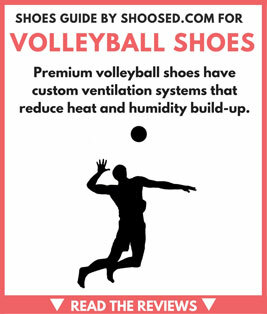 They are designed just for volleyball and feature a Solyte midsole to provide durability and stability. The shoe has both forefoot and rearfoot gel cushioning to provide excellent shock absorption. Added to that is the NC rubber outsole that provides good traction along with the thread design. Available in three stand-out styles these shoes make a statement with bright colors and patterns. If looks are important to you out on the court, you will love this shoe. It is quite impressive when it comes to aesthetics. You will love the Flashpoint 2 as it provides optimal flexibility to increase your game performance. Verdict: You will love the fit of these shoes as they encapsulate and support your feet in the highest level of comfort. The Adidas Performance women’s Volley response shoe is made with a synthetic and a rubber sole. The upper is made with a breathable mesh and synthetic overlays to offer support. The synthetic overlays are perforated to provide more ventilation. This shoe is made with a torsion system that provides integrity for the mid-foot area. The toe area is made from TPU which gives it the ability to be abrasion resistant. Featuring a textile lining the Adidas performance women’s volley response shoe is comfortable. It has a removable insole for customization and the ADIWEAR outsole provides traction and durability. These shoes will help you feel fast and light all while keeping you stylish thanks to it being available in many different styles. You will love the boost forefoot that helps to launce you into powerful spikes. Verdict: You will also love how your feet stay dry and cool thanks to the seamless and breathable upper. The Nike Volley Zoom women’s shoes are made from synthetic material. It features Flywire technology which provides support while being ultra-light, so it doesn’t lend to fatiguing your feet. It's low cut ankle allows you to move with a full range of motion. The heel is made from TPU which allows it to provide lockdown and stability when you need to remain grounded. Nike Volley Zoom shoes offer a variety of styles - you will love it. You will also love their lightweight design. Their patterned rubber sole provides top of the line grip and traction when out on the court. Verdict: These shoes provide quick cuts and smooth transitions on the court thanks to the lateral outrigger and the TPU heel. You will love the low profile cushioning on these if you don’t like bulky shoes. The Asics Gel Rocket 7 is made with a light synthetic mesh upper and an NC rubber sole. This rubber material is made with more natural rubber which helps to provide improved traction. For comfort and shock absorption the shoe features a gel cushioning system in the forefoot. This gel cushioning is designed specifically for the court and the overall game. You will like the lightweight design that the Trussic system lends to the shoe. This lightweight feature allows you to move more freely on the court. If you play multiple sports on a purely recreational level, you will like these shoes as they are very versatile. With updated styling you can find a number of color options to choose from when it comes to the Rocket 7 from Asics for men. Verdict: There are enough style variations here so you can find one to match your team’s colors if you play organized volleyball in a real team setting. The Adidas men’s Essence 12 is made with a synthetic upper and rubber sole. It is available in a white, bold orange and black design and is specifically designed for volleyball. The shoe features a toe area that is abrasion resistant and also features lateral stability to offer side to side support. This shoe is very versatile and can be used for a variety of uses. It offers a wide toe box to ensure plenty room for your toes to be comfortable. You will love these shoes if you have wide feet or like the feeling of having your toes have space to splay appropriately. The abrasion resistant front/side area allows the show to hug the court and gives you the ability to cut quickly. Verdict: You will love the design which provides ample support and cushioning for a long game on your feet. The Mizuno men’s Wave Bolt 4 are available in a white and black combination design. It is made with a triple layered AIRmesh synthetic textile upper and an extra grade rubber outsole. The outsole is designed to be non-marking so it won’t mark your floor but will still provide extreme traction. Featuring parallel wave technology the shoe provides shock absorption and dispersion throughout the sole of the shoe. This enables it to provide heightened stability and excellent cushioning. It also features Dynamotion Groove and Dynamotion Fit technologies that provide agility and flexibility thereby relieving stress on the foot and diminishing instability at the forefoot. Verdict: You will love this shoe’s ability to make playing volleyball more comfortable. You will like the removable insole that allows you to use your own if you would prefer. The ASICS men’s Gel-Netburner is made with a fabric upper and a rubber sole. The upper features mesh with overlays that support your feet. The tongue features logo embroidery and is padded as well as is the collar. The Gel-Netburner comes in a lace up design in three different styles. It features a GEL cushioning system in the forefoot as well as the rear foot that provides exceptional comfort. The shoe also features the Trusstic system that lightens the sole weight and increases stability and durability of the shoe. If you need ankle support you will love the design of these shoes. The design also leaves room for ankle braces up to a large brace if you need to wear one. Verdict: They also have a wide forefoot that is perfect for those who have wider feet. It is suitable for all activities so is a great pick for recreational sports players. The Mizuno men’s Wave Tornado 8 is made with a synthetic/mesh upper and a rubber sole. It features Pebax Mizuno Wave technology that was designed specifically to provide excellent cushioning for landing and jumping stability in a game. The midsole is made with enhanced AP offers cushion durability and rebound without bulking up the shoe. In the forefoot, there is more cushioning to help to absorb shock. The technology used to design the shoe allows for the reduction of stress on your feet and the ventilation that goes throughout the midsole ensure that your feet are always cool and dry. You will love this shoe if you have flat feet as it has a power panel that helps to reduce overpronation especially as is seen when doing lateral pivoting. Verdict: These shoes are great quality when it comes to fit comfort and durability. If you want to bring your performance to the next level, you need the best volleyball shoes. Men and women choose their shoes based on different criterions. You need shoes that will flex properly, that will be comfortable, that will provide stability and that will be lightweight while providing you with top quality traction on the court. Choosing just one shoe to stand above the rest is hard especially when we have two categories: one for men and one for women. We find that for both men and women our top choice would have to be the Asics Gel-Rocket 7. This shoe is available in both men and women’s designs each with their unique features for each gender. They offer top of the line comfort, stability and flexibility. We believe that of all the shoes listed here the Asics Gel-Rocket 7 shoe is the best bet for both men and women based on price, quality and available colors and styles. Since these are available in both male and female styles, your entire team can get one that matches the team colors, so you look more uniformed playing together.